If you meet these basic requirements, you will be eligible to attend DDA to complete your CDL training. What Programs Does Diesel Driving Academy Offer? DDA offers 3 different types of CDL certification programs. The CDL Prep Course is a 3-week, 136-hour prep course that teaches the basics of the trucking industry. No previous experience driving trucks is necessary to enroll in this course. Our Basic CDL Driver Training Program is a 4-week, 160-hour program that requires no previous experience to enroll. This program will prepare truck drivers for the entry-level duties of a truck driver. Evening classes are available at our West Monroe campus. The evening program will run 8-weeks and 160 clock hours. The Advanced CDL Driver Training Program is a 20-week, 600-hour course that gives you the advanced knowledge you need to be a truck driver. There is no experience required to enroll in this course. Upon completion, you will be able to obtain employment in a variety of different lines of work including as a Truck Driver, Line Haul Driver, Owner Operator, Semi-Truck Driver, or Over-the-Road Truck Driver. Evening classes are available at each campus and will run 30-weeks and 600 clock hours. What is the Cost for CDL School? Out of pocket costs will vary depending on the program a student enrolls in, and if any financial assistance is used. DDA offers a variety of programs that may cover some or all training program costs. Don’t let the cost intimidate you. DDA’s Financial Aid staff can help you learn more about what types of assistance are available to you to help make getting your CDL affordable. How Do I Find Work Once I Get My CDL? 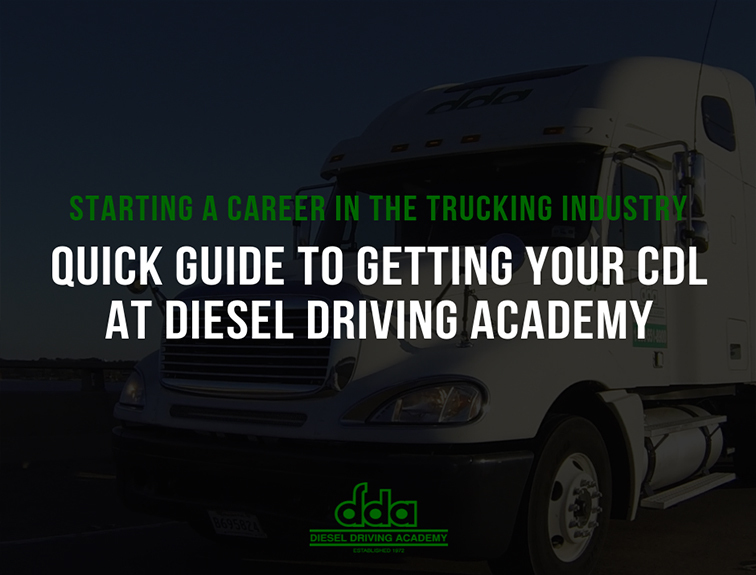 Diesel Driving Academy provides a Job Placement Assistance for all of our current students and graduates. This service is available to former students for the rest of their careers. We have a variety of connections to some of the largest carriers and employers nationwide. In addition to this service, many recruiters visit our campuses to hire our highly trained and well-qualified graduates. What Kind of Benefits Can I Expect As a Truck Driver? These are just some of the benefits that the truck driving industry offers. Job security is also a huge benefit of this industry. There are currently about 60,000 driving jobs open in the US. As consumer demands grown, so will driver opportunities and employment options.